Last fall, thinking it would take months for our house to sell, we thought we could spend late winter and early spring in sunny southern Utah. Those plans changed when it took longer than we had hoped to get the house ready and it sold faster than we imagined. As we planned to spend the summer in Alaska we decided to stay farther north to avoid some driving. We chose to spend the past 5 weeks in Oregon which, unfortunately, has been experiencing one of the coldest wettest springs on record. So our hiking and John’s photo opportunities have been more limited than preferred and we have basically been killing some time while waiting for better weather further north. The good news is we are finally beginning to post photos on Flickr. After leaving the Columbia River Gorge we went to Sun River (near Bend). We both needed a good conditioning hike so, despite pissy weather, we headed to Paulina Peak located within the Newberry Volcanic National Monument. We encountered more snow at the trail head than we expected but it was well consolidated and we did fine without our snow shoes. The windy whiteout conditions contributed to a feeling of wildness we both found appealing but the GPS was appreciated. We had hoped to climb South Sister however the National Forest Service website indicated that, even though the road to the trailhead had been plowed, there was no parking available. So we used a rare sunny day for a conditioning snowshoe up Mt Bachelor. 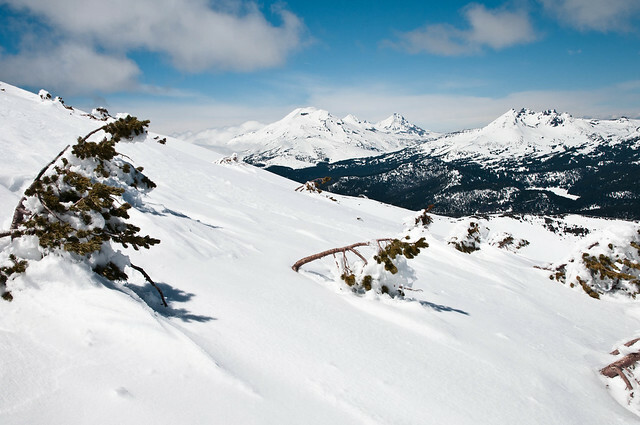 The ski area was closed for the season and while not the back country experience we prefer, between the chairlifts and the buzzing of nearby snowmobiles, the view of the Three Sisters and Mt Hood from the summit was great. We later discovered that snow plows had in fact cleared a few places wide enough to park along the side of the road near the South Sister trail head. We checked weather forecasts, picked what we thought was an acceptable weather window but still started out in cloudy drizzle. We got high enough for the drizzle to become snow but tired of being in a cloud again. Once we had gained about 3000 ft. we talked ourselves out of going any further so we turned around short of the summit. 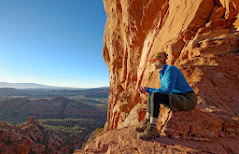 Our photos from these dayhikes are on Flickr. After leaving the Bend area we went to Fort Klamath in Oregon, a small rural community in a lush valley near the south entrance of Crater Lake National Park. 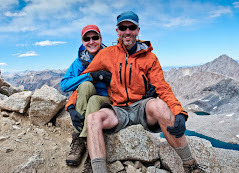 We had to bag a planned snowshoe/backpack trip (more about this below). As trails were not yet open to hiking due to snow our visits were limited to views from overlooks along the portions of Rim Drive which had been plowed. 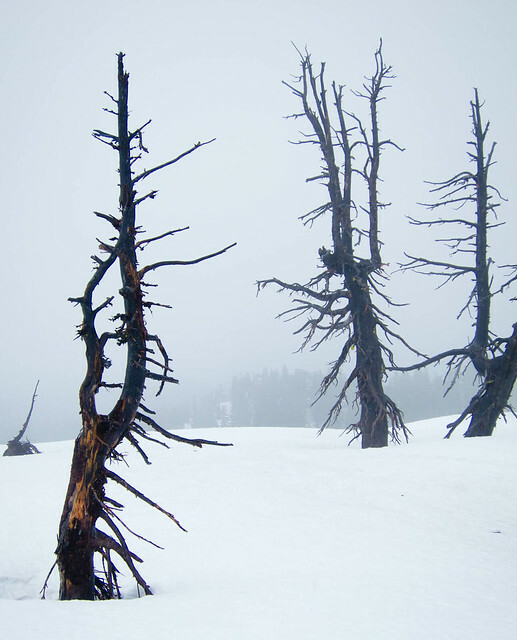 Our Crater Lake sightseeing photos are on Flickr. We hadn’t been in too much of a hurry to head north as weather conditions in the Canadian Rockies had been just as bad as in the Cascades. But we decided if we were going to get to Alaska this summer it was time to begin working our way north. ... and the unusual Twister Falls. 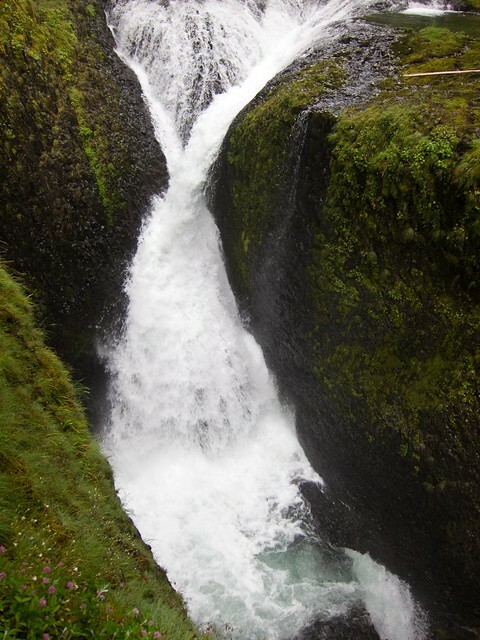 Our Eagle Creek dayhike photos are on Flickr. We then spent a week in the Seattle area, enjoying some sunny weather and visiting our son Tom before we went north for the summer. 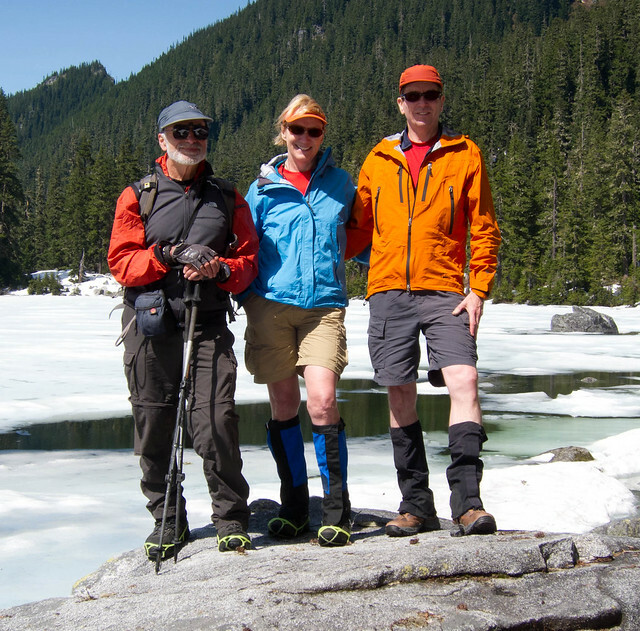 We also got together with our friend Miller for a great hike, off Highway 2 near Steven’s Pass, to Surprise Lake and Glacier Lake. The weather was great! 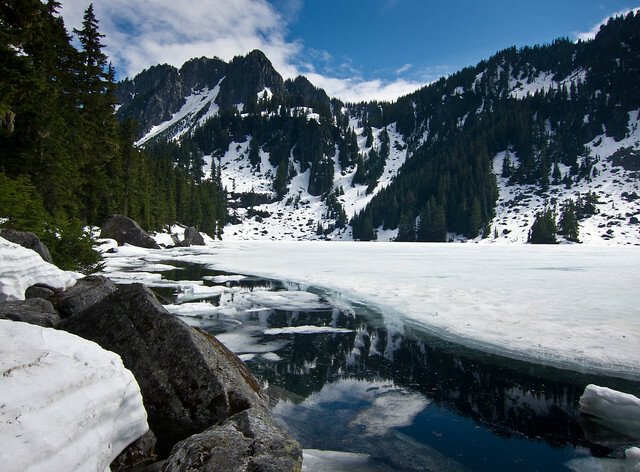 Both lakes still had a fair amount of snow and ice on them and were quite beautiful. Our photos from this dayhike are on Flickr. We’ll be crossing the Canadian border soon. We plan to pass through Prince George on our way to the Alaska Highway. Our intent is to travel through Canada quickly to maximize our time in Alaska. Once the weather begins to turn colder there we’ll head south and spend more time in the Canadian Rockies on our way back to the lower 48. But who knows? Our plans can always be subject to change. 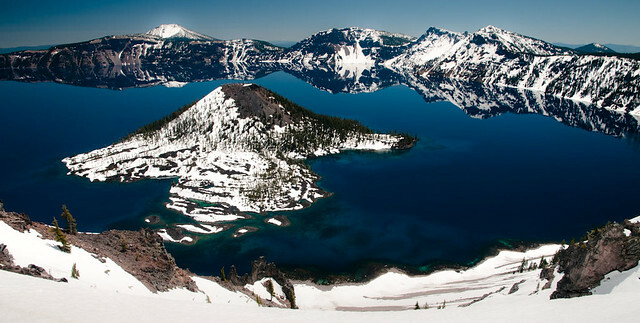 We had to bag the snowshoe/backpack trip we had planned, the scenic 33 mile long Rim Drive around Crater Lake. We were planning to stay out 3-4 nights which would allow time for a side trip up Mt Scott. However, the previous week John had sustained what we thought was a relatively minor injury to his left thumb. Surprisingly a few days later it swelled up and became so painful that late one night we were willing to endure the waiting room of the nearest ER, 40 miles away in Klamath Falls. John came away with antibiotics and pain pills. We thought the worst was over. But no, that was just the beginning. We were shocked when this formerly mild mannered digit morphed into the “Thumb from Hell”. Two days later the increased swelling and visible abscess drove us back to the dreaded ER. It was like a bad low budget horror movie where a couple is terrorized by something ridiculous, like a possessed thumb. Back in the ER “Thumbzilla” was finally subdued after being lanced, drained, debrided and dosed with an additional antibiotic (not to mention covered by a cartoonishly large bandage). One thing that I learned is that I didn't fully appreciate our opposable thumbs until my husband didn't have use of one of his. 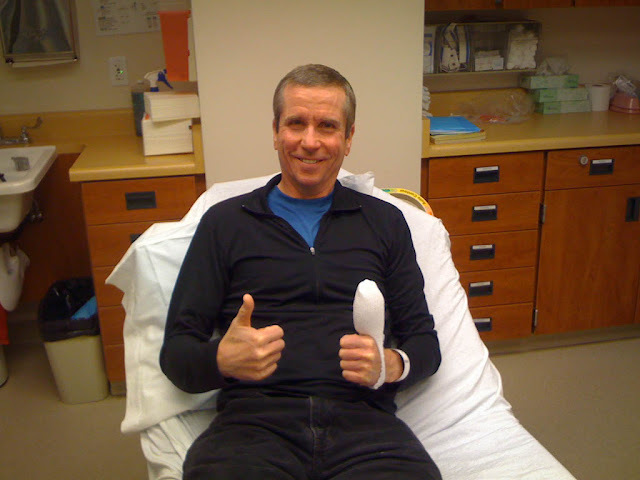 John in surprisingly good spirits after days of pain, frustration and hours spent in an ER waiting room. Once we got over thinking “It’s just a thumb for God sakes!” we knew we couldn’t complain. After all, we live in America where we can hop in a car, obtain good health care and have health insurance to help pay for it. And it’s not like this happened at the beginning of a 2 week vacation. We’re retired so we have some time for absurd illnesses and injuries. 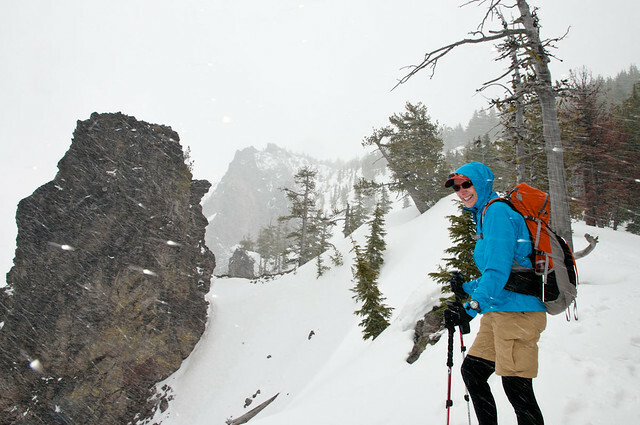 And it ends up that we wouldn’t have really enjoyed that snowshoe around Crater Lake anyway. We were about 2 weeks too late for decent snow and enough unplowed road to make it fun. We may not have gotten what we wanted but we are grateful that we always get what we need.